We are pleased to announce that St Davids Veterinary Hospital has achieved ‘Outstanding’ for two RCVS Practice Standards Scheme Awards. 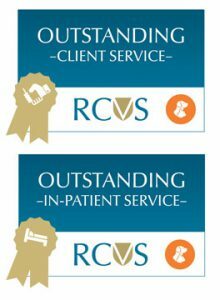 These awards are in both Client Service and In-patient Service. The RCVS is the governing body for veterinary surgeons and these awards are given to practices who demonstrate high levels of care for their clients and inpatients. These awards are in addition to the RCVS Small Animal Veterinary Hospital quality assurance the practice already holds. This is a fantastic achievement for everyone at St Davids Veterinary Hospital. We are all delighted to have these awards; everyone works really hard to give our clients and their pets excellent service and receiving such high recognition has given us a strong sense of pride and assures you, our clients, that we are dedicated to giving you, and your pets, the very highest standards of care. We would like to thank all our clients and their pets for their continued support.